This post is about my OCD and some random things that came to me about it. I have been writing down thoughts I have had about it for the last few months. This started after I wrote the following as a status on Facebook. This got me thinking about my OCD and how it affects me. It sometimes feels like the OCD and me are fighting and I often loose, although I have a small victory every so often, which helps me to feel somewhat better. Obsessive Compulsive Disorder is not just about being a neat freak and really well organised, although in some cases that can be part of it, but to a degree that is less helpful than it sounds. In my case it is my own mind nagging me, sometimes almost all day. Stress and anxiety can make my OCD flare up worse. At times I get cross and frustrated with myself due to the OCD, making me even more stressed and the OCD even worse. I have wasted hours of my life redoing things that were perfectly OK already. Sometimes things just do not feel ‘right’ despite being told they are fine and even being able to see for myself they are fine, they can still feel wrong. At times I redo something over and over to the point it is like I am stuck in a loop and have to force myself out of it. One way I have found that can help me to not get stuck in a loop in the first place is singing, although this only works with certain OCD rituals and not on a really stressed out bad day. I sing to myself to distract me from the OCD thoughts or to make me feel less stressed. It can help me to get through a task such as dressing or getting ready to go out. Some people assume I am singing because I am really happy, which is often not the case. Sure I do sing to myself when happy sometimes and when a song is stuck in my head, but I often use singing to block out the nagging in my own mind. One of my worst rituals is my bed time routine. On a bad day it can make bed time seem kind of scary for me, as I know it will take me far too long that day to get to sleep. If I only have to do my rituals once before bed I call that a win. However once asleep I generally do not have trouble staying asleep and sleep very well. When I am in the middle of certain rituals and someone interrupts me it can mean I have to start again from scratch depending on the exact nature of the interruption and the stage I am at with the routine. This can get very tedious if I am interrupted a lot. I once saw a documentary on TV about OCD, one sufferer sick of people telling him to ‘just stop’ when it came to his rituals said it is like telling someone with a broken leg to just walk it off. This is a very good analogy, if it was that simple to just stop, why would we still be doing it? I do not want to be brushing my hair over and over to get it neat, to the point it gets greasy quicker than it should or checking the front door is locked three times before going to bed, but some days my compulsions are just too strong. People who say to me ‘I can be a bit OCD at times to’ can get rather annoying when they are referring to the fact they like routine or are just a tidy person. Most people have ways of doing certain things they prefer, but when I spent all morning getting dressed and ready to go out because I had to do certain things over and over again then it can sound a bit like a kick in the teeth. OCD is a diagnosable clinical condition that can come with therapy and in some cases medication. However some people seem to think of OCD as a term for just being fussy or pedantic and make jokes to that effect. OCD memes on social media also often make light of the condition and can help spread misconceptions about it. For example ‘I have COD, it’s like OCD but the letters are in alphabetical order, as they should be’, which just totally misunderstands what OCD even is. Then there are those who think that I can just go and get therapy for my OCD and it will go away. Mental health therapy is not always that simple, and OCD therapy, at least on the NHS is very rigid and in my case hardly made a difference long term. The only thing they seem to offer for OCD is Cognitive Behavioural Therapy, which is supposed to help reduce ritualistic behaviour by helping you to confront your obsessions and resist the urge to carry out compulsions, learning instead to tolerate the anxiety till it is no longer such a dominant voice in your mind. However I was only allowed twelve sessions of CBT in total, and they kept trying to make them over the phone or online and not in person. Also I have since been told that CBT for autistic people is often pretty ineffective, but the NHS seem to not like to treat both at the same time even though they are co-dependent conditions in my case, I guess funding works one name condition at a time even if you have conditions that can be hard to separate from each other and tell which is which at times. All the nagging in my mind, the rituals and redoing things over and over can be mentally draining at times. By the end of some days I feel very tired from having had my own brain have a go at me all day, however going to bed will then be a whole other set of rituals that will mean I sometimes take ages to finally get into bed. 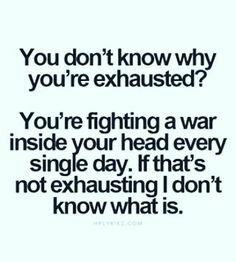 Meaning that I am often still tired the next day and some days never seem to feel fully awake. This is one of several reasons I do not feel able to work a full time job and come off benefits right now. OCD is often a lonely and confusing condition when other people do not understand what you are going through, even when they try to understand, people often seem to not really get what it is like to live with. I now use mental health chat rooms and sometimes find other people who have OCD which can be interesting and helpful, making it slightly less isolating for me. I wish that I could have had places like this when younger. I count myself somewhat lucky in that I do not have the extreme version of OCD where people think loved ones will die or get hurt if they do not do their rituals correctly and can have nasty visions of things happening to people they care about. I gather this type of OCD is much rarer and often occurs in people who also paranoid. However this does not mean my type of OCD is easy to live with and it is still a real condition with real problems attached to it.